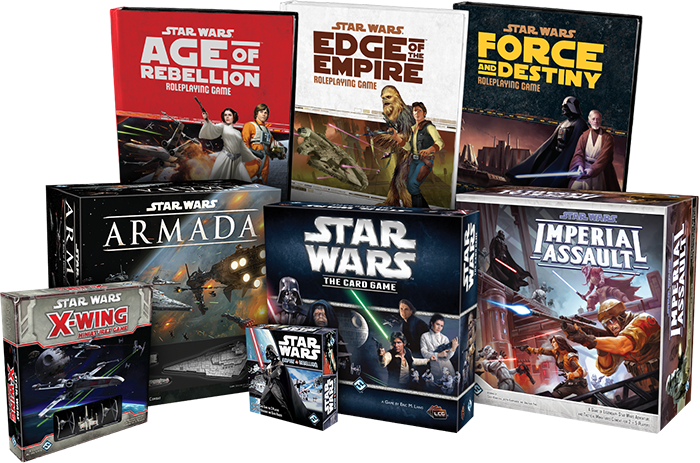 Fantasy Flight Games is proud to announce our May the 4th celebration: an evening of Star Wars™ gaming at the Fantasy Flight Games Center! This May 4th at 6 pm, you can join us at the Fantasy Flight Games Center in Roseville, Minnesota for an evening of excitement and fun with all our Star Wars games. This event has grown larger every year and we're thrilled to be a part of this worldwide celebration of all things Star Wars! The Star Wars experience is filled with fearless heroes and deadly villains, set against a backdrop of a war that spans the galaxy. At this event, you can play out the classic stories of Star Wars, battling in space with starfighters and capital ships or fighting alongside iconic characters like Han Solo, Darth Vader, Luke Skywalker, Leia Organa, or Emperor Palpatine. Whether you’re roleplaying an aspiring Jedi in Force and Destiny, commanding the movements of the Rebel fleet in Star Wars: Armada, or leading a deadly strike team in Imperial Assault, our May the 4th event offers games for every aspect of the Star Wars experience. Come to play the games you love and learn some new games during the event – we'll be offering demoes of all our Star Wars games. You can learn to survive the perils of the Outer Rim in Edge of the Empire, or pit dark side against light side in Star Wars: The Card Game. In addition to these demoes, every game will have open play available for you and other attendees. You can meet and play games with other members of the Star Wars community. You may fly against your friends in a game of X-Wing™ or help other players complete a daring raid in an Age of Rebellion session. Every game offers a chance to make new friends as you adventure in the Star Wars universe. What's more, you'll also have the chance to test your skills against each game's designers! Fantasy Flight staff and developers will be on hand to meet attendees and challenge you in our Star Wars games throughout the evening. Can you outfly the ace pilots of Fantasy Flight, or lead your strike team better than our top generals? The May the 4th celebration at the Fantasy Flight Games Center is your chance to challenge the staff at your favorite Star Wars games. Your starfighter is ready. Your strike team awaits your command. The Imperial Navy is prepared for your arrival. Join us on May 4th at 6 pm in the Fantasy Flight Games Center for a celebration of Star Wars tabletop gaming!